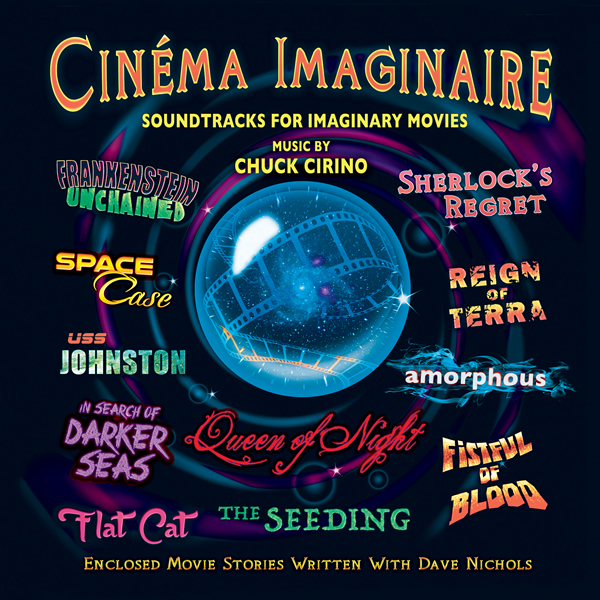 DRAGON'S DOMAIN Records presents CINÉMA IMAGINAIRE, an original concept album featuring music composed by Chuck Cirino (CHOPPING MALL, DEATHSTALKER II, RETURN OF SWAMP THING) in collaboration with author and screenwriter Dave Nichols. As teenagers Chuck and Dave would listen to the movie soundtracks of composers such as Ennio Morricone, Jerry Goldsmith and John Barry on vinyl LPs and fantasize over the jacket art and liner notes before they actually saw the films in movie theaters. Together they would imagine what was happening in the movies to match the music. Frequently, their imaginations conjured up better stories than the actual films themselves. 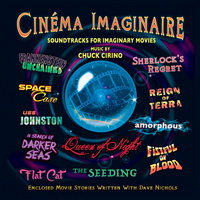 CINÉMA IMAGINAIRE is a unique CD release featuring film music composed by Chuck for eleven film concepts written by Chuck and author Dave Nichols. More than a hypothetical movie soundtrack album, it's a unique audiocinematic experience containing eleven musical movie soundtrack suites based on eleven original story ideas. The concept expands as each musical suite is supported by a written synopsis depicting the story. Following the music suites, there is some additional bonus material that should appeal to fans of the composer’s work. The eleven stories featured in CINÉMA IMAGINAIRE offer up a unique opportunity for Chuck to demonstrate the many facets of his musical talent. With SHERLOCK’S REGRET, Sherlock Holmes is trapped on the other side of a dimensional rift. He's in a steampunk London where pterodactyls soar over Big Ben and are chased by impossible air ships. In ENJIE, we follow the exploits of a young woman from the Philippines who moves away from her home country to begin a new life in America. In A FISTFUL OF BLOOD, a grizzled bounty hunter, an ancient Aztec crystal ball, and a psychokinetic killer meet under the desert sun in this fantasy spaghetti western. IN SEARCH OF DARKER SEAS delivers the salty sea tale of three brave kids who helped save Panama from the infamous deeds of Henry Morgan, so-called "King of the Buccaneers". In FRANKENSTEIN UNCHAINED, Doktor Frankenstein is back and this time he's working for the United States Military Complex. Can he build an army of reanimated super-soldiers? Oh, yes, he can. Watch out, Kim Jong-un! QUEEN OF NIGHT tells the story of Queen Nefertiti, once the Great Royal Wife of Akhenaten, Pharaoh of Egypt... and due to a curse, she's still alive today and a dancer in Los Angeles, at the Vortex sky top private dance club. FLAT CAT was conceived as a Bakshi-esque animated comedy where a reanimated road-kill cat returns from the dead to fight congressional crime from the sewers of Washington DC. A tale of fantasy, THE SEEDING is set in a giant Sequioa forest where something has altered the life force of Grandfather Tree and it becomes the conduit for an otherworldy transference that will change a young woman’s life forever. In SPACE CASE, conceived as an animated sci fi comedy, Cute little cuddly, but deadly, aliens from outer space are charged with purging the galaxy rim of unremarkable but self-destructive vermin who do harm to their own planets. When a beacon sends them to Earth, they find exactly what they're looking for. But will Humanity even take them seriously? In REIGN OF TERRA, we follow the madcap adventures of family pets Bently the Pug and Max the West Highland Terrier who are suddenly separated from their owners smack dab in the middle of a zombie holocaust. Will they ever re-unite? Only if Bently can use his psychic abilities. The final story, U.S.S. JOHNSTON – BATTLE OF SAMAR, is based on a true story. The Battle Of Samar is one of the heroic WWII sea battles Hollywood hasn't touched upon yet. Out-numbered, out-gunned, out-armored and pursued by a large portion of the Japanese Navy, a commanding officer of Native American ancestry turned his relatively small battleship around and took the enemy on face to face, stalling their advance on unprotected allies. Chuck Cirino did not start his career as a composer, but rather as a programmer in Stroudsburg, Pennsylvania for a Public Access cable TV station, where he learned how to create TV shows by himself, without a crew. In his spare time, he experimented with the station’s video equipment and created a series of genre productions that allowed him the opportunity to learn how to incorporate special effects into his work. After relocating to California, Cirino transitioned into directing high-end special effects television commercials. His first work as composer was for the 1980 cult film GYPSY ANGELS, which starred Vanna White and Richard Roundtree. Since then he has scored films for Roger Corman, directed music videos for bands like Earth, Wind & Fire and The Dickies’ KILLER KLOWNS FROM OUTER SPACE, and has recorded over 40 music soundtracks for feature films including SORCERESS, RETURN OF THE SWAMP THING, HARD TO DIE, TRANSYLVANIA TWIST, and many others. Dave Nichols is the author of two books and Editor-In-Chief of Pisano Publications in Agoura Hills, California. He also starred in his own Spike TV motorcycle series and co-wrote the legendary Federated TV commercials starring Shadoe Stevens as Fred Rated. Chuck Cirino and Dave Nichols have been churning out story ideas for movies since they were teens together in high school. Both of them migrated from the East Coast to Hollywood back in the early 1980s and work together creatively whenever they can. CINÉMA IMAGINAIRE from DRAGON'S DOMAIN is expected to begin shipping the week of January 23rd and can be ordered at www.buysoundtrax.com. The first 100 copies will be autographed by Chuck Cirino.